and the VFW Fair Grounds. 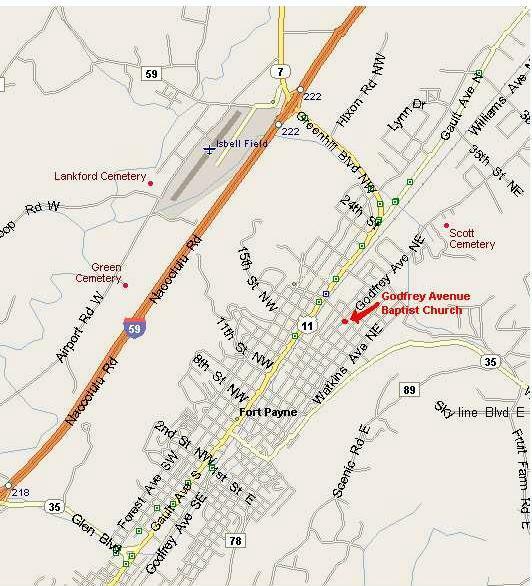 Turn onto Highway 11 (Greenhill Blvd) toward Fort Payne until you get to 18th Street North. Turn left, go across the railroad tracks, and go to the next Traffic light. This is Godfrey Avenue and you will be looking at the church on your right-hand across the street. Turn onto Highway 35 South (Glen Blvd) toward Fort Payne. Hwy 35 will take you onto Gault Avenue, then you will turn right onto 14th Street North. After crossing the railroad tracks, there is a traffic light on Godfrey Avenue. Turn left and go to 18th Street North. The church will be on your right.